Are you LOSING 2% or MORE of your Bottom Line to Poor Pricing? As moderator of the session on Pricing Strategies for Profit at Today’s Garden Center magazine’s Revolutionary 100 Roundtable held in Atlanta’s America’sMart I asked the people representing the 22 companies in the session if they would write down on the note pad in front of them the number representing 2% of their annual sales. Then came my challenge to them. The challenge was to put the piece of paper on the front of the table for me to pick up if they had learned enough new information about pricing in the previous hour of the session to add a minimum additional profit of 2% of sales to their bottom line in 2010 – WITHOUT THE CUSTOMER NOTICING. I would then pick the note paper up and have the event staff total them and share the number at the Town Hall closing session. ALL of them did. And what a number we had to share! A total additional profit of $5,261,000.00, averaging $239,000.00 per company was produced. The least amount claimed was over $30,000.00. And think about it – every one of these companies has left those dollars on the table every prior year. Did you? This is the fifth misconception in a series of six. The concepts being discussed here will likely be counter to your beliefs. The comments left on the previous posts are quite interesting so you may want to go back and read them. Click HERE to go back and begin with the first post related to this series. Possibly one of the greatest travesties to befall the independent garden center as an industry is the fallacy that if you offer lower prices you will “make it up on volume”. This is what I call Fifth Grade Economics. The general level of knowledge about economics in our industry was learned in fifth grade social studies class. In my fifth grade class Mrs. Woods taught us about supply and demand, and how if you lowered the price you would “make it up on volume”. Unfortunately this same macro-economic principle has been perpetuated in higher education and has not been balanced with understanding of the micro-economic application in an independent garden center serving niche demographic and psycho-graphic customers. The introduction of the new Taggle concept for in-store bidding on merchandise at participating retailers brought about a plethora of media reports on the haggling fad. Now some retailers are adopting haggling procedures and training their associates. Don’t fall for it. How to participate in the recession . 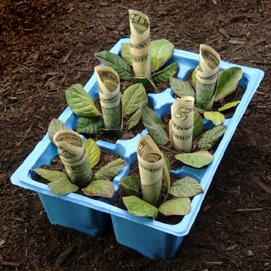 . .
How much are plants worth this spring? How do the rules of doing business during recession apply to you? While it could be good advice to follow a growing trend of people who have decided not to participate in this recession, even better advice may be to participate fully in the effects the economic downturn is causing. Should you make sure you get your share of any government stimulus money opportunities? Or, should you pay more attention to the way you run your business and get everything lined up to increase sales and margin dollars this year? The news on early spring gardening interest is much better than anyone anticipated six months ago, or even three months ago. I hope you are not getting tired of hearing about it in all the garden center industry news yet! The question is, are you ready to make everything you can of it, without hanging your backside out so far you cannot recover if it falls short.